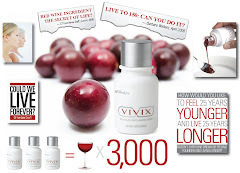 Again more Vivix testimonials keep coming across my desk. Please be aware these testimonials come from folks who are using the product. They are in now way meant to be claims in anyway shape or form. These tesimonials are just their experiences they have noticed after taking the products. We don't know wether it will work for you or not. I can say though Shakee products do come with a 100% money back guarantee. It's up to you wether you feel compelled enough to try it. "Tom and I have been taking Vivix for 1 week and 2 days and after about 5 days Tom noticed that his ankles no longer hurt. He had broken them both as a youth playing sports. Tom is 65 and arthritis hit his ankles this year. He had to get up and take pain meds so he could sleep. After taking Vivix for just 5 days he no longer needs pain meds to sleep." - Nancy D.
"My brother-in-law, who is 75 and recently had some physical problems, got a strong tremor on his right hand. He started Vivix, his only Shaklee product-and within a few days his tremor is gone and he is writing normally again! He is duly impressed and thankful." Linda D.
"I suffered severe neuropathy in both my legs and feet. In addition to that, I had 3 stints put in my left leg last summer and was diagnosed with PAD. I was experiencing severe leg cramps nightly. Hardly a night went by when I wasn't awakened by them and had to jump out of bed and walk around. This would happen several times a night. Since taking Vivix, I have not been awakened a single evening with a leg cramp. So wonderful! And I can feel my toes again. They no longer feel like wooden appendages down there. Bless Shaklee and Vivix! I now experience full nights of restful sleep."